Sul celebrates after winning last year's Wing Bowl competition. This Friday marks the second annual Wing Bowl competition at Cherry Hill East. Although the competition was a highly anticipated event in the early 2000s, the event suddenly disappeared and was forgotten about for multiple years. 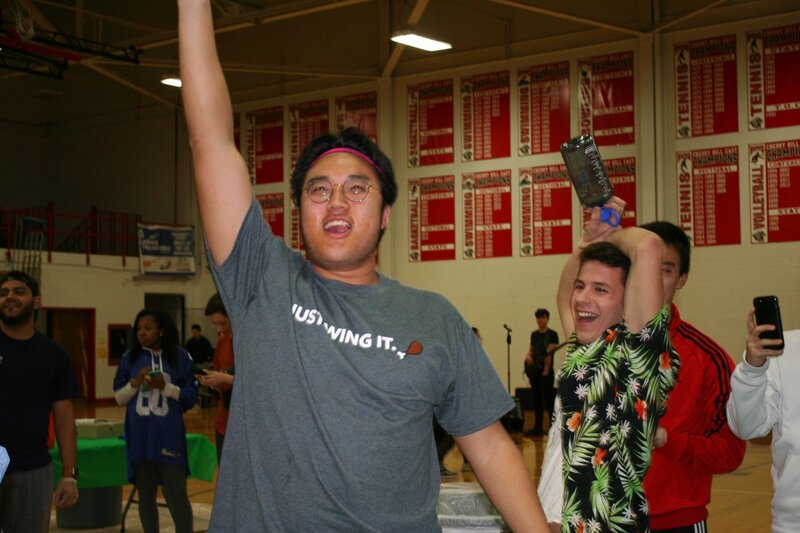 Due to the large turnout last year, Wing Bowl is currently seeing its re-emergence as East students and teachers prepare to take on the fierce competition. The event is being held in the DiBart gym for $5 for all attendees and begins at 7 p.m. The first round will be six minutes long and all contestants will eat as many wings as possible from Jug Handle Inn. At the end of the six minute round, half of the contestants will be eliminated from the competition. Cherry Hill East Wing Bowl legend, Mr. Rick Friedman, will be the referee of the event. Round two will be four minutes and the contestants will be faced with eating as many wings as possible again. Once again, half the contestants will be eliminated after this round. Round three will be two minutes, and the three contestants with the most cumulative amount of wings will move on to the final round. Round four will be one minute and will decide the winner of Wing Bowl 2019. First place will receive $100, second place will receive $75, and third place will receive $50. The student contestants this year will be Tim Ackerman (‘22), Rohan Arige (‘21), Mason Bulicki (‘21), Anthony Fiore (‘19), Anthony Gambino (‘19), Charlie Hess (‘19), Jake Hoffman (‘19), Feng Huang (‘19), Nick Kokolis (‘19), Kevin Lochbihler (‘20), Daniel Obeid (‘21), Tyler Semon (‘21), Saurabh Shah (‘19), Roberto Sul (‘19), Christian Torres (‘20), Erica Tran (‘20), and Sarah Zheng (‘20). The teachers participating this year will be Mr. Caskey, Herr Graff and Mr. McVeigh. Last year’s Wing Bowl Champion was Sul, who ate 41 wings from P.J. Whelihan’s. Sul is coming back this year ready to defend his title. This year’s competition also only features two female contestants; Tran and Zheng. The Student Government Association (SGA) is extremely excited to this years turnout. As school spirit has dwindled in the last couple of years, Wing Bowl looks to be an event that brings the East community together. Wing Bowl looks to be one of the biggest East events of the year, so make sure you’re there. From front to back, your February issue is amazing!